When it comes to reach and online presence, social media is king. Social platforms, like Twitter, Facebook and LinkedIn, are a key component of any inbound marketing strategy. You can use them to share content, attract new visitors to your website, network and engage with relevant people and build a community of fans that will keep coming back to you. Today we're talking about Twitter. A fast-paced, ‘microblogging’ tool, Twitter allows you to join conversations, search by hashtags and post 140-character updates with URLs, images and videos. As a lead generation tool and reputation building platform, it's the bee's knees. Download our free guide to the Anatomy of an Inbound Marketing Tweet to learn how to create your best ever Twitter posts. When it comes to using Twitter for inbound marketing, it's all about attracting your target audience, giving your followers content they find valuable and demonstrating your brand as an industry thought leader. Turn Twitter into an effective inbound channel by building strong habits. Understanding your Twitter audience is key. If you’re just starting out, tweet for your intended customers, acting on hunches and following Twitter best practices. As you grow your follower count, aim to gain insights into their identities and online habits. Using the free version of Moz’s Followerwonk, you can analyse your followers, as well as the accounts you follow. Type your Twitter handle in to get an overview of where your followers live, what times of day they (and you) are most active, their ‘Social Authority’ scores, the most frequently occurring words in their bios and more. Directly engage with anyone who @-mentions you, offering them relevant content, thanking them or responding to questions and feedback if applicable. According to Buffer, best practice tweet frequency entails tweeting 5 times a day or more and, in general, “as often as you have engaging, entertaining, or useful content to share." To make sure you’re posting enough, it’s a good idea to schedule tweets, spaced out throughout the day. HubSpot offers social media scheduling with their software, and there are also free and paid versions of Buffer and Hootsuite to queue up posts and monitor traffic, leads and engagement. Just link up your Twitter account to your chosen platform, and never forget to tweet again. You may want to intersperse scheduled tweets with live tweets, but scheduling your tweets will keep your Twitter account ticking along smoothly. Schedule links to new blog posts and other pieces pieces of content, and post short tips and hacks. 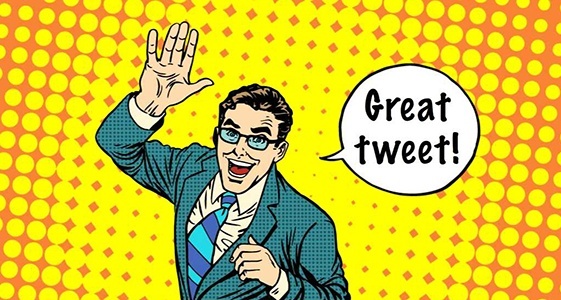 You can then ‘live tweet’ other interesting content you find around the web, as well as retweeting mentions and engaging with people on the fly. Photos on Twitter lead to a 35 percent boost in retweets, so it makes sense to opt for visual posts wherever possible. Post a mixture of photos and other types of graphics for an interesting and diverse timeline. You could include your blog header images, stock images (from Pexels, Shutterstock or the like), thumbnails of your eBook front covers or create your own graphics and images using the Pablo app from Buffer, such as photos overlaid with quotes or statistics from your blog posts. Canva is another excellent source that allows you to create compelling graphics for free! Twitter also supports GIFs, and videos see a 28% boost in retweets, so don't be afraid to incorporate moving images to see how this impacts engagement levels. Get the most out of Twitter by using it for a variety of different functions. Make an account for your CEO and other key members of your team, use Twitter for PR or blogger outreach, ask your followers questions, post live updates from events, announce special deals and promote your content. Make relevant contacts on Twitter by finding and following others, but also take a truly inbound approach to your Twitter marketing to get new visitors ‘through the door’: use hashtags like keywords so that relevant people can come to you via your tweets. Try Lead Generation Cards with strong calls-to-action to encourage people to fill in their details to sign up to newsletters. Twitter's targeting options mean you can reach the right people. Above all, be willing to experiment creatively with Twitter and learn as you go. A substantial part of the inbound marketing battle is creating remarkable content that your audience loves. The other part is getting people to consume it. To attract and retain customers, you need to ensure they love what you stand for. In standing out from your competition and getting people 'on side', your content is your most valuable asset. Sharing it in a way that resonates with your targets is of prime importance here. Think about your targets when crafting each tweet, and speak directly to their needs, desires and goals. It all comes back to how well you know your audience, as this is the key to successful inbound marketing on Twitter.